You must be 21 years or older and have valid identification to enter the festival premises. Security searches may be conducted upon entry to ensure the safety of all festival goers. No shirts, no shoes, no beer. Outside food, drinks, or alcoholic beverages. Backpacks, suitcases, coolers, or large bags. All bags are subject to search upon entry to the event. Unapproved marketing material, such as pamphlets, handouts, or advertisements. Masks, makeup, costumes, or clothing which disguise the identity of anyone entering the event premises. Any other items, as determined by security. An age ID wristband must be shown to be served beer. Tickets, tokens, or glasses from previous Umpqua Brew Fests or other beer festivals are not valid. Beer is only served in this year’s Umpqua Brew Fest glasses using this year’s tickets. No more than two glasses at a time are served per customer. No beer sales after 9:00 p.m.
Alcohol must be consumed on the premises of the venue. All festival participants are expected to drink responsibly. Any person who is believed to be intoxicated will be denied entry. Security will be notified to deal with persons who appear to be intoxicated during the event. Anyone causing a disturbance or safety concern will be asked to leave the premises without a refund. Smoking is not allowed anywhere inside the venue. A designated smoking area is provided outside the building, but smokers must be at least 10 feet away from doors. By entering the event premises you consent to being photographed and or filmed. Your image, voice, and likeness may be used for promotional purposes. Any photography or video taken at the festival, whether in digital or analog format, is subject to a mandatory, non-exclusive license for Umpqua Brew Fest promotional purposes. If you take pictures, please post your best shots on the Umpqua Brew Fest Facebook page and tag us. 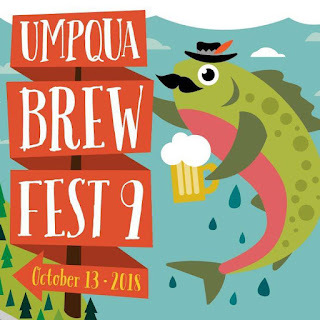 Umpqua Watersheds, Inc., the host organization of the Umpqua Brew Fest, cannot accept responsibility or liability for any personal property or belongings lost, stolen, or damaged, and cannot accept responsibility or liability for any personal injury, accident or illness.